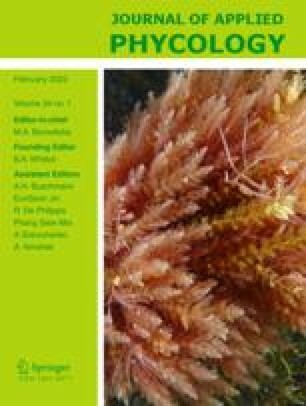 Mass culture of benthic macroalgae under rough offshore conditions in the North Sea requires rigid culture support systems that cannot only withstand rough weather conditions but can also be effectively handled while at the same time retain the cultured species. Various carrier constructions and different mooring systems were tested. Laminaria saccharina grew on all of these carriers with initially high (up to 14.5% per day) and later decreasing length increments. Longlines, ladder and grid systems had certain disadvantages and these are discussed. The study results led to a new ring carrier (patent pending), first used in 1994/1995, which was gradually improved until 2002. This system now emerges as being superior, since it resists not only rough weather conditions (2 m s−1 current velocity, 6 m wave height) but also permits ease of handling when compared to other constructions. The ring allows various operational modes and can be equipped with culture lines that can be collected offshore or transported to shore facilities for harvesting. The modular nature of the tested ring system lends itself for future use in integrated aquaculture systems located in or attached to offshore wind farms. 1.Alfred Wegener Institute for Polar and Marine Research (AWI), Am Handelshafen 12BremerhavenGermany.